I had so many book reviews to squeeze in at the end of March that this post got pushed back a few days, but I still want to share all the books the girls enjoyed in March. We finished Miss Hickory (which was peculiar, yet charming) and then I decided to start reading to the two older girls separately so each could listen to a book tailored to her own interests. Little Miss Muffet just finished listening to Hitty: Her First Hundred Years by Rachel Field, which is the story of a doll's adventures with a series of owners. It's written at a much higher level than she could read on her own, but she has comprehended it well and learned a lot of history in the process. With Little Bo Peep, I'm switching back and forth between The Milly-Molly-Mandy Storybook and Old Mother West Wind. She has not been especially attentive, but she is enjoying them from what I can tell. In the evening, my husband is reading them the Moffats series. 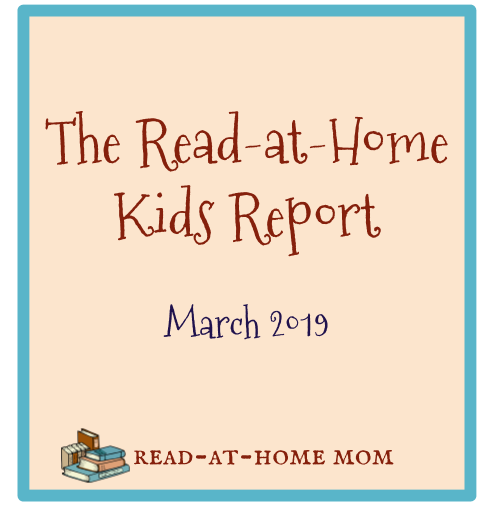 He finished The Moffats and The Middle Moffat, and now they're hearing Rufus M..
We also undertook a couple of reading challenges on Instagram leading up to St. Patrick's Day for which we read five picture books of a different color every day for six days. The big girls each chose two books, and I chose the fifth, and we read them aloud after breakfast. This was a great way to revisit some old favorites and to discover some books on our shelves that we hadn't read yet. Little Bo Peep was especially into this idea, and she is still looking at some of the books we read even two weeks later. For school this month, we've been exploring many different topics. We started (but decided not to finish) a disappointing nonfiction title about fish (Classifying Fish by Louise Spilsbury). Then we reviewed some of our natural history lessons by comparing the timeline in A Brief History of Life on Earth by Clemence Dupont to the illustrations in Life Story by Virginia Lee Burton. We're also still occasionally dipping into Dinosaurs: The Most Complete, Up-to-Date Encyclopedia for Dinosaur Lovers of All Ages, though her interest in dinosaurs is starting to fade a little bit. My plan is to read aloud The Fantastic Flying Journal by Gerald Durrell next. Independently, she is also reading a variety of titles, including books of Norse myths (Adventures with the Giants and Thunder of the Gods), collections of Irish fairy tales (Favorite Fairy Tales Told in Ireland by Virginia Haviland and Tales from Old Ireland by Malachy Doyle), series books (the latest Sophie Mouse and book 3 of the Heartwood Hotel series), and audiobooks (the usual favorites - Muggie Maggie, Mitch and Amy, and The Year of Billy Miller.) During school time, she is also reading a biography of Louis Braille on Open Library. Little Bo Peep has been enjoying peeking into her sister's Sophie Mouse collection and she likes to look at the omnibus edition of the first four books in the series. She also likes to have her sister read aloud to her, and I've caught them together on the couch sharing such books as Fin M'Coul by Tomie dePaola and Ten Little Fingers and Ten Little Toes by Mem Fox and Helen Oxenbury. Bo Peep has become more interested in playing with toys than looking at books during naptime, but she does like the occasional audiobook. Just the other day, she listened to Tops and Bottoms while acting the story out on the flannel board at the same time. Her Eloise Wilkin book was confiscated because she wasn't treating it nicely, and that seems to have diminished her interest in her for the moment, though I'm sure the loss of interest isn't permanent. The other books she has been carrying around the house with her are our two Catholic children's Bibles: The Catholic Children's Bible by Sister Mary Theola and The New Catholic Picture Bible by Lawrence G. Lovasik. I'm also teaching Bo Peep the consonants and their sounds using The Ordinary Parents' Guide to Teaching Reading. We have done B, C, D, F, and G so far. Little Jumping Joan has fallen in love with word books: Happy Baby Colors by Roger Priddy, Richard Scarry's Just Right Word Book, DK's My First Words, and DK's My First Word Board Book. She is especially intrigued by animals, and likes to growl at bears and anything she perceives to be similar to a bear. She is also completely obsessed with both The Babies on the Bus by Karen Katz and Ten Little Babies by Gyo Fujikawa (both of which she has basically destroyed), as well as Atinuke's new picture book, B is For Baby. She refers to each of these books as "babies" and mostly just walks around the house with them. I keep trying to read them to her, but mostly she howls at me until I agree to just let her hold them. She also likes to point to babies' toes in the illustrations and say "feet." Jumping Joan is also beginning to notice that we have a lot of bookshelves in our house and she walks around the living room, visiting each one and asking "whassat?" I have no doubt she will be a book lover like her sisters.